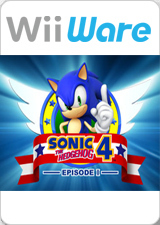 Sonic the Hedgehog 4: Episode I is a platforming video game released developed by Dimps and Sonic Team for the Wii's WiiWare service. The first of two episodic releases, it is billed as the successor to Sonic & Knuckles on the Sega Genesis/Mega Drive. Designed to be similar to the classic Genesis games, Sonic 4 combines the traditional 2D gameplay of classic sonic games with 2.5D graphics and new gameplay elements. Players control Sonic running, jumping, and defeating badniks through levels at high speeds. They may also use power-ups such as the iconic speed-up shoes, barrier shields, and invincibility. The game also features special stages where the player must go through a maze, based on the special stages from the original Sonic the Hedgehog, to find the seven Chaos Emeralds; the reward for this is the ability to play as Super Sonic in normal levels, not seen since Sonic & Knuckles. The graph below charts the compatibility with Sonic the Hedgehog 4: Episode I since Dolphin's 2.0 release, listing revisions only where a compatibility change occurred. r6199 Windows 7 Intel Pentium P6200 @ 2.13GHz Intel HD Graphics 3000 40-60FPS, runs at full speed but slight performance drops when Sonic's speed increases.